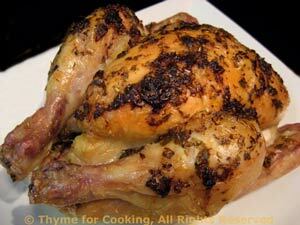 Thyme for Cooking Menus: Roast Cornish Hens with Wine Sauce, easy recipes. You can substitute a small chicken if your prefer; the roasting time will be about 10 minutes longer. A lot of people don't like Brussels Sprouts. A lot of people over-cook them. Think there's a relationship? 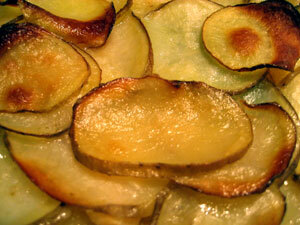 As with most vegetables, simple and quick is (usually) best. Trim Brussels sprouts: slice a bit off of the stem end and peel away the outer leaves - any that are damaged, wilted or discolored. Cut each sprout into 4 slices. Slice shallot about the same thickness. Heat oil in a medium nonstick skillet. 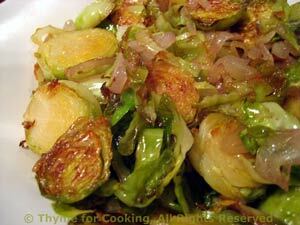 Add Brussels sprouts, shallots, and sauté until crisp-tender, 10 - 12 minutes. 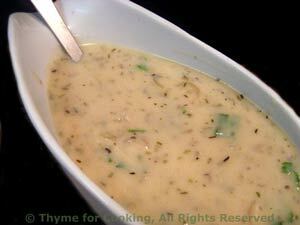 Add chicken stock and thyme, cover, reduce heat and simmer 5 more minutes, until just cooked through. Sprouts should be bright green and still retain a wee bit of crunch. Simmer a few minutes longer if you prefer, just be careful not to overcook or they tend to be bitter. Uncover, cook off stock and serve.